My creative work has suffered recently with the advent of job hunting. The good thing is that it seems I am still in high demand which always makes the hunt easier, but it is hunt nonetheless. It takes time and energy and concentration. The great thing is that I have completed most of the big projects, so, the ‘to do’ pile isn’t taking up so much of the garage. One thing that The Kid and I did recently was a real change of styles. 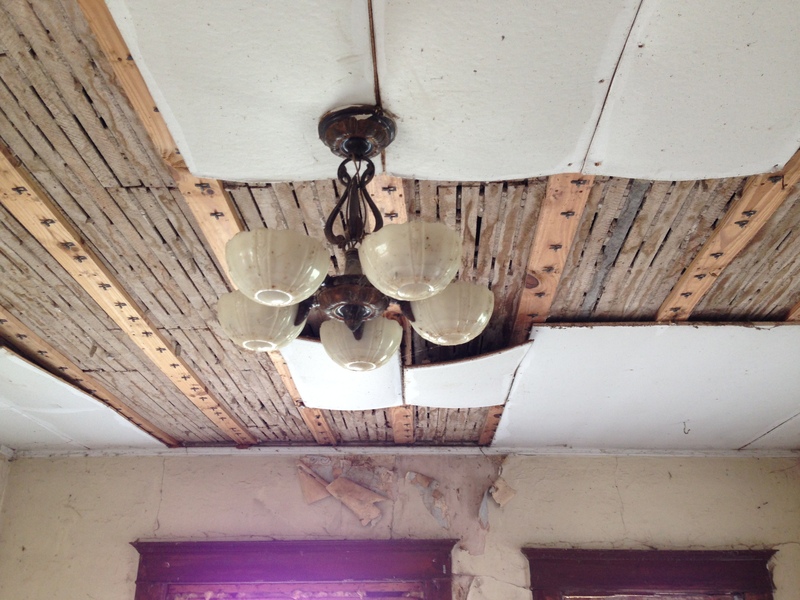 We were notified of an old abandoned house that was scheduled for demolition – as the farm land was being incorporated into a commercial farm. Side note: I would love to find one of these old farm houses that is still in good shape and just buy the house and the land under it and live on it. Out in the middle of no where with just enough land to grow vegetables and a few dogs and have a barn for restoring furniture. But then I am reminded of the whole “no internet” thing and having to drive everywhere for groceries and materials and restaurants! And then I put that little dream back into the dusty recesses of my mind. Anyway, these old houses can be a treasure trove of goodies. Sometimes you get lucky and find all kinds of wood work – such as doors and trims and moldings, even staircases and sometimes even stained glass! 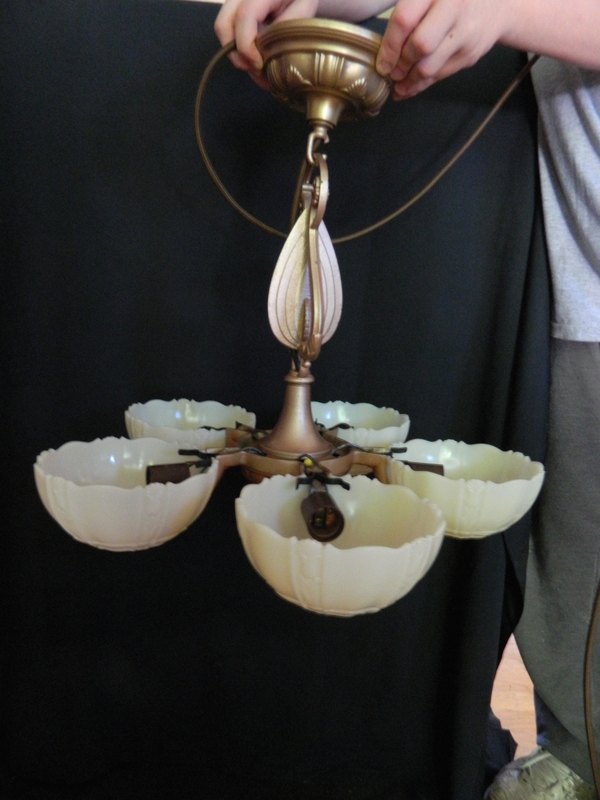 This particular farm amazingly had this pristine chandelier hanging in the living room… with five perfect shades on it! This is just about unheard of! 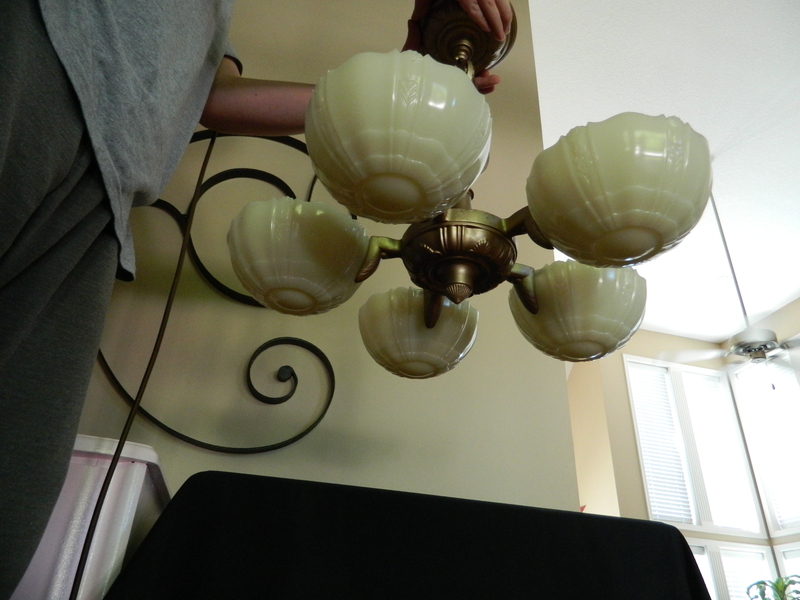 In fact, the same chandelier hung in the next room – sans shades of course – so we took that too, just in case we needed extra parts for the first one. Believe it or not, it was still wired and I am betting that if the house had electricity, throwing a switch would have resulted in light! Once home, it was time to clean up that bad boy. 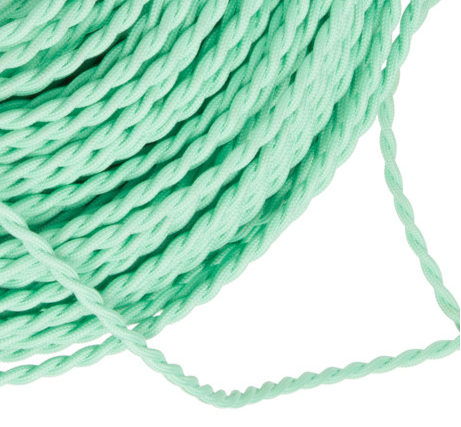 I had order new sockets and fabric wrapped wiring from my new favorite lighting place, Color Cord Company. The selection available is so great, that it took me forever to finally choose a color! Great problem to have, I say! 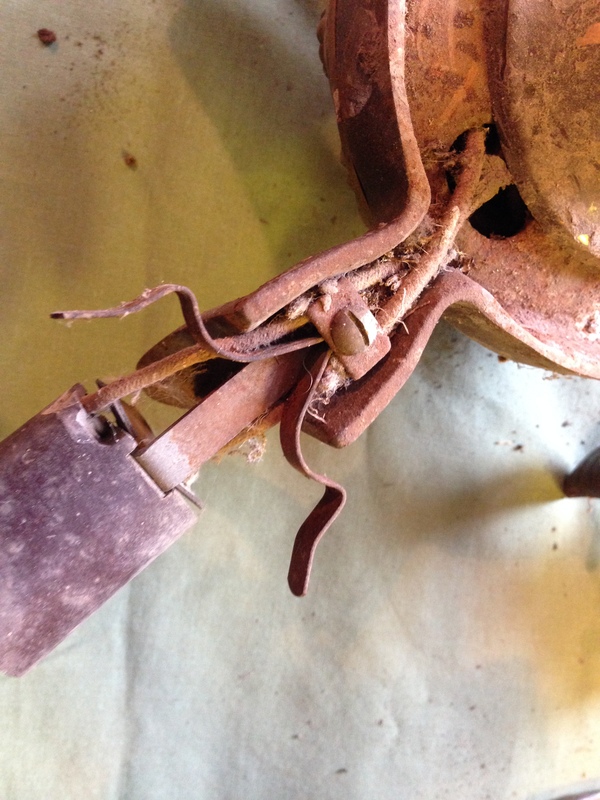 You can see what decades of neglect can do to a fixture… even one of this quality. I set about taking it all apart and cleaning all the pieces. The finish was word very badly in a couple of places, so I just opted to spray paint everything. 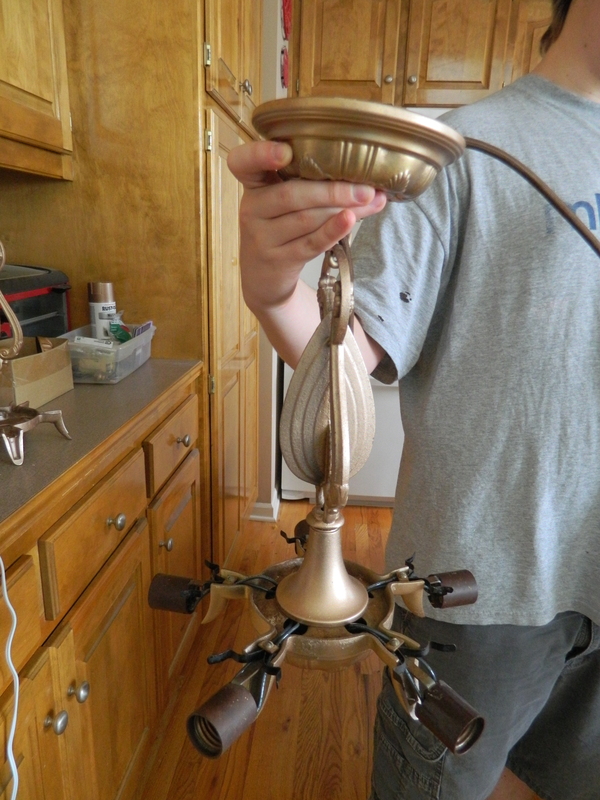 Another decision that took a while to make, whether to paint it to look like the original brass or update the color. 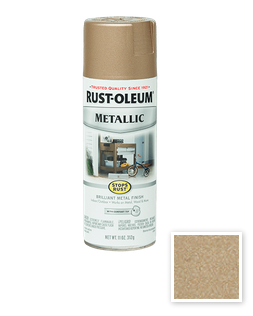 After perusing the paint aisle at Home Depot, I selected a beautiful new shade called Rose Gold. This is similar to the brass but prettier and softer. I had cleaned up both sets, just in case we needed to use parts from one, but everything was there! Now The Kid set to re-wiring the fixture. 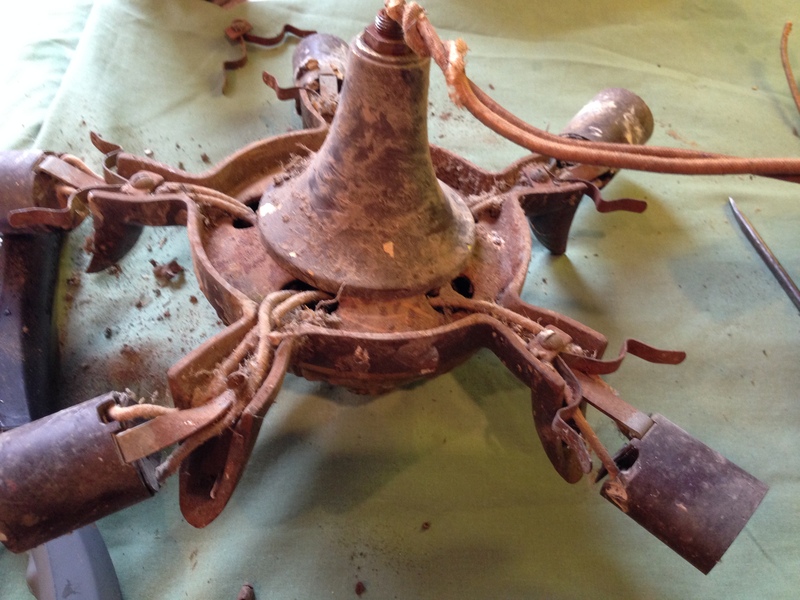 We were actually able to salvage the original sockets! Talk about quality! I love his attitude when faced with something new. He researched it online and then went and bought the materials he needed and set about completing the job. 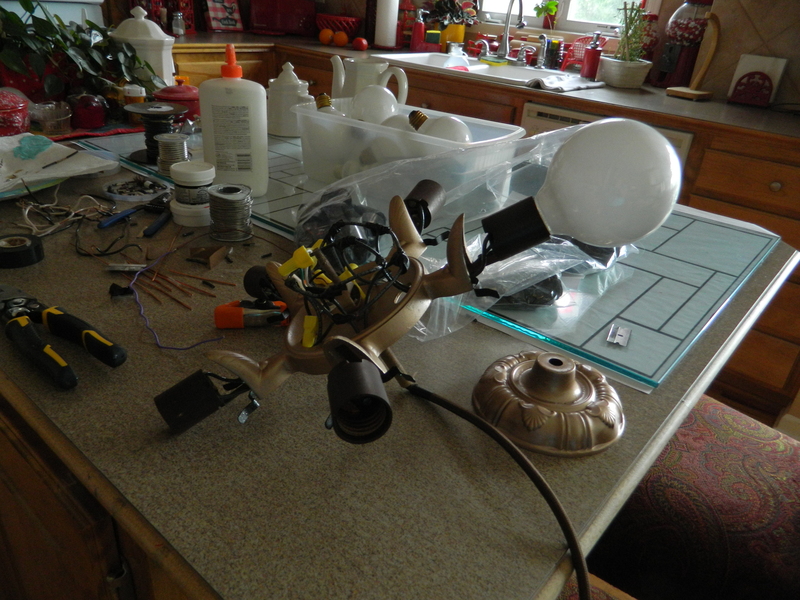 Then it was time to piece the chandelier back together. Slipped the shades on to it (they are called “slip shades”… something I learned in working on this project. No holes!) and we were done! I had chosen the deep brown fabric cord and included about 8′ of extra cord so that if someone wanted, they could add a chain and hang it from a higher ceiling. From the research I did, I was able to find that this was about 1930’s era, called ‘Art Deco’. Amazing that after 80 years this was still hanging and its five slip shades were in pristine condition! I have been on the lookout for five more shades, up to this point, I can only locate four. 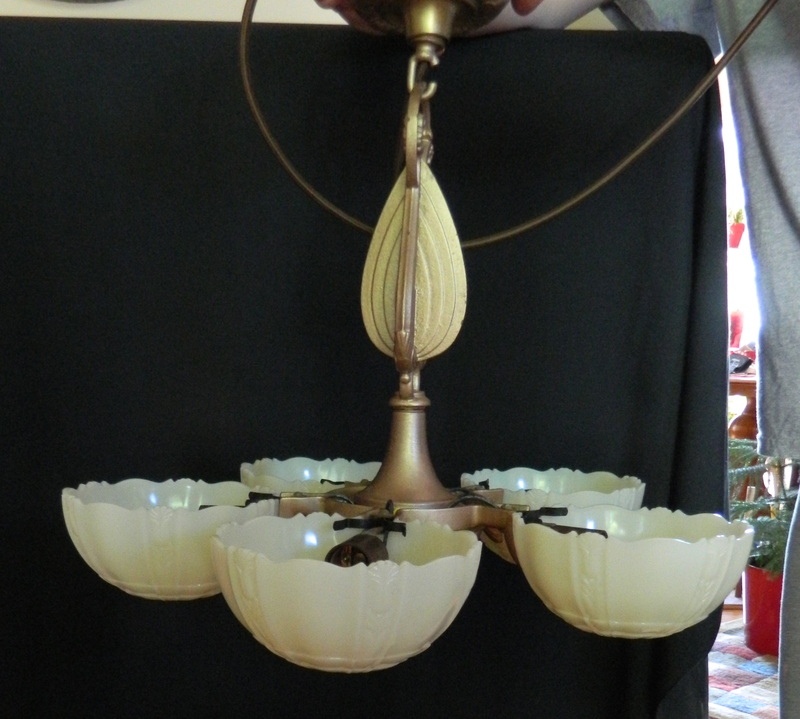 If I am able to acquire the necessary five, I will put the other fixture together as well. What a bonus it would be to have matching chandeliers! I am so tempted to use these in my hallway, because they are simply beautiful and elegant, but they really do not match my house’s more modern style. And I do need two in the hallway. So, we’ll see what comes first, if I find five more shades or the first one is sold. We’ve been trying to do some gardening but we have been having an unusually wet and cool spring. The Kid digs the hole for the compost and the rains come and fill it like a miniature swimming pool! I will share more tomorrow! There are so many things that I love about my house, but one of them ain’t the builder standard lighting. Slowly but surely I’ve been replacing those very practical and perfectly functional lighting fixtures with upgraded ones. I’ve wanted to do something really unique ever since I stumbled onto this online company that sold electrical cording and custom colored socket covers. And a lot of other cool and awesome stuff. This is going to take some more planning and purchasing of supplies, including a way to reach the ceiling when it is about 20 feet high. 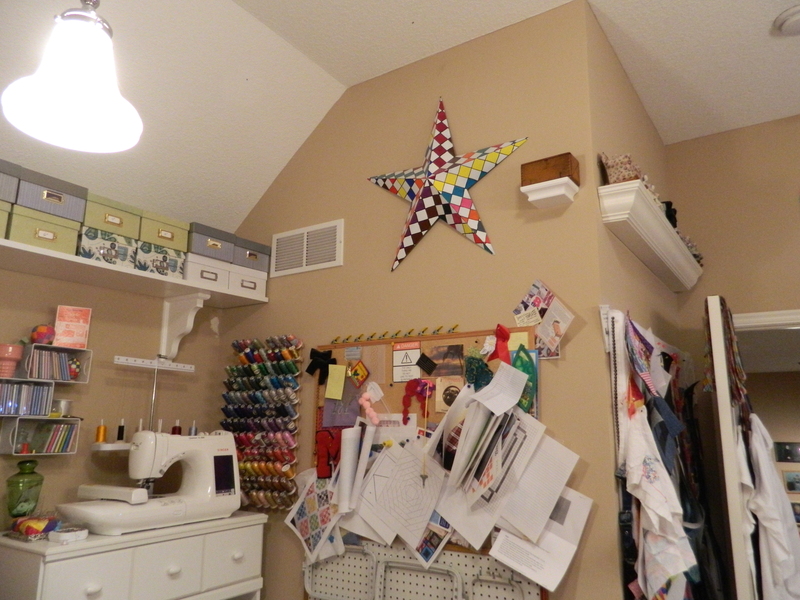 Instead, with the latest addition of the embroidery machine, I realized that corner in my sewing room was a little too dark. 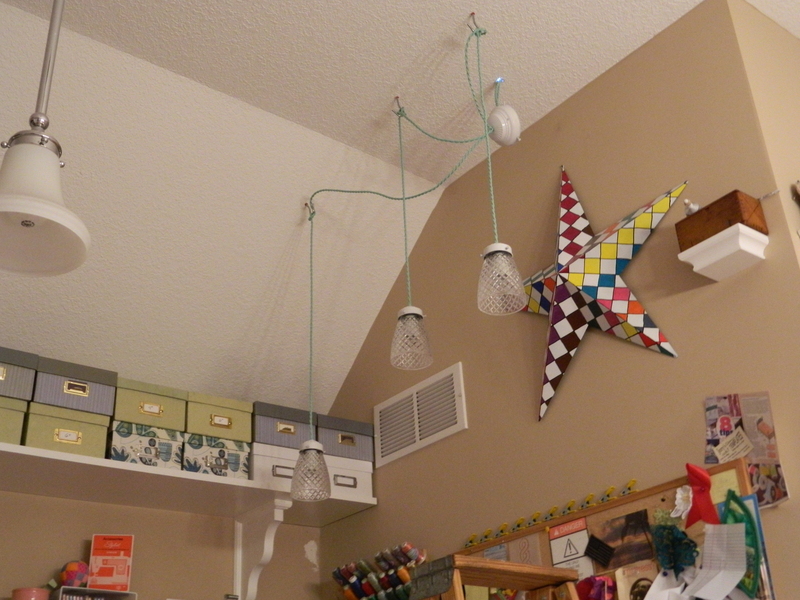 It does take some additional light when you’re dealing with lots of thread color changes and lots of stitch changes. So, I opted to do my first lighting project for that corner. 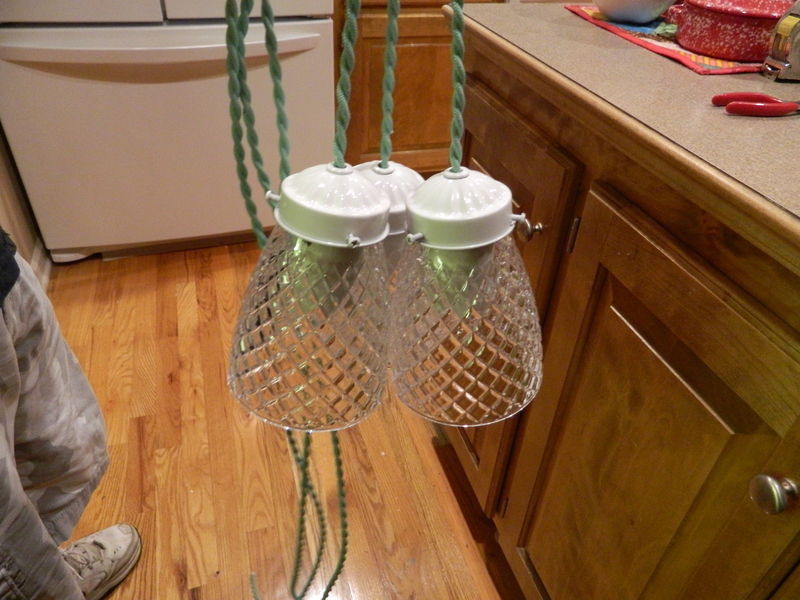 Somewhere along my travels, I picked up two pairs of hanging lights. I didn’t know then what I was going to do with them, I just knew that I had to have them. Try as I may, I can’t remember if it was from thrifting or the ReStore or abandoned house hunting or where. 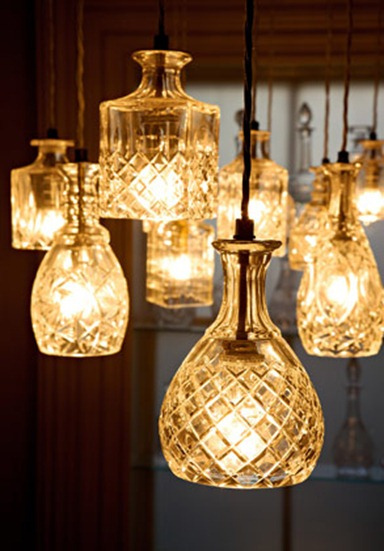 Each had two wires that came from a single canopy ending in a cut glass globe. Of course, the wires were interwoven with those brass chains so popular beginning in the late 50’s. So, this is where I started. I took everything apart and pulled out the old wiring. From ColorCord company, I ordered new sockets, wiring and cord grips. This is the best part, when you order, you have a myriad of colors and styles of wiring and different styles of sockets and socket covers and cages and all sorts of fun stuff. Check it out! I ordered the mint twisted wiring and ceramic sockets. 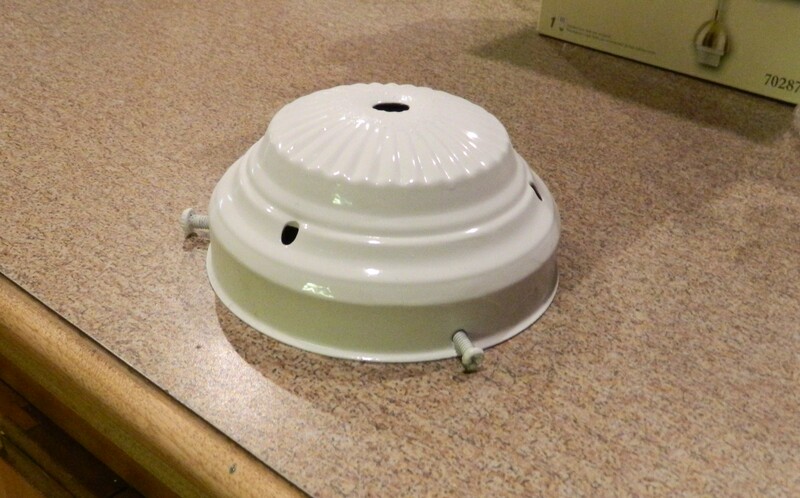 My plan was to take the existing canopies and the pendant holders and spray paint them white. 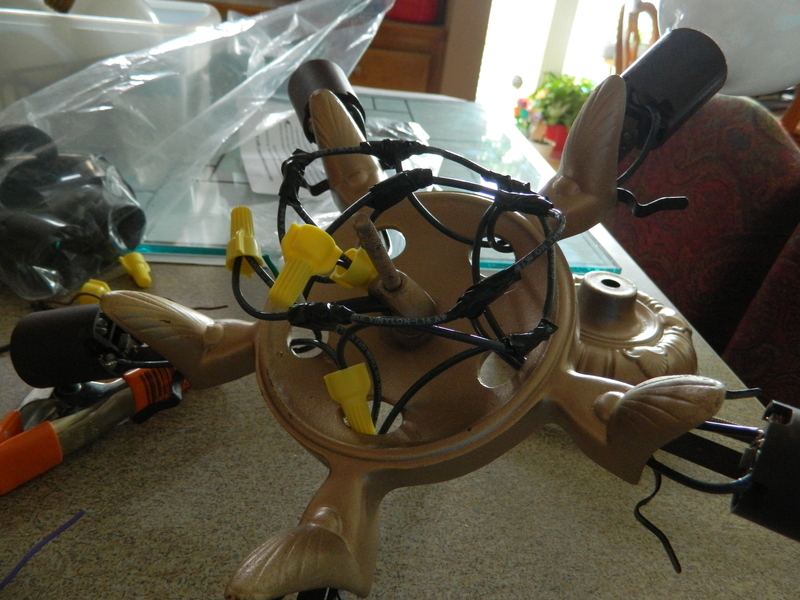 Replace the wiring with the twisted mint cord and swag them over the areas needed. In my mind’s eye, I could see it. 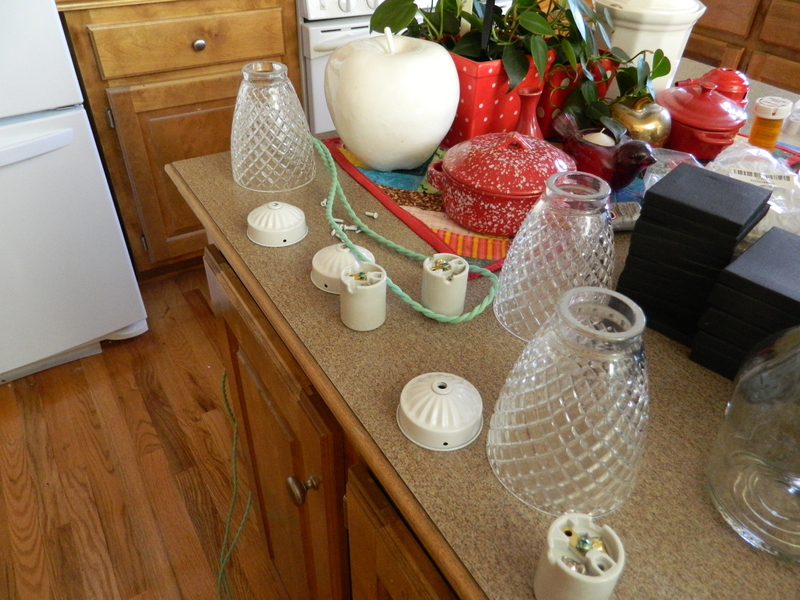 On a recent thrifting trip, I ran across three cut glass tulip design globes that were open ended and I thought would provided better light than a closed one. 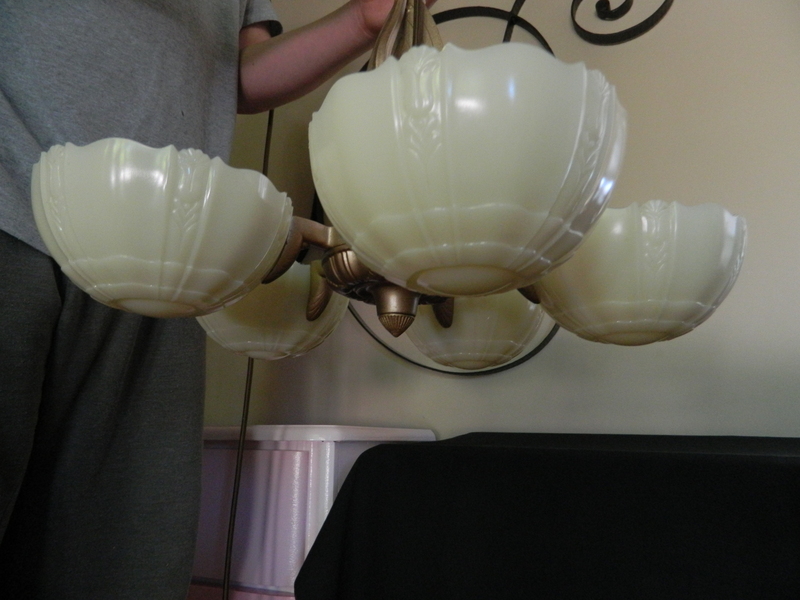 So, I went from a four bulbs on two fixtures to a single one with three shades. That meant that the four existing pendant caps that I had would have to replaced with three matching. And instead of the two canopies that I had planned on using, I would be using just one now. 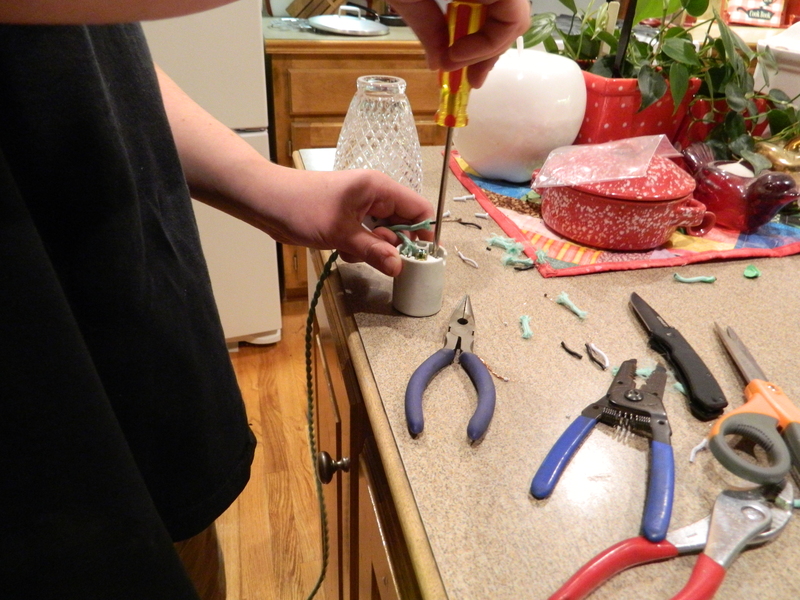 First, The Kid – my newly appointed electrical engineer – wired the sockets. Then added the cord grips. The cord grips are new to me, but take the strain off of the wiring in the sockets, much as the chains used to in the old style. Then the wires were threaded through the canopy. 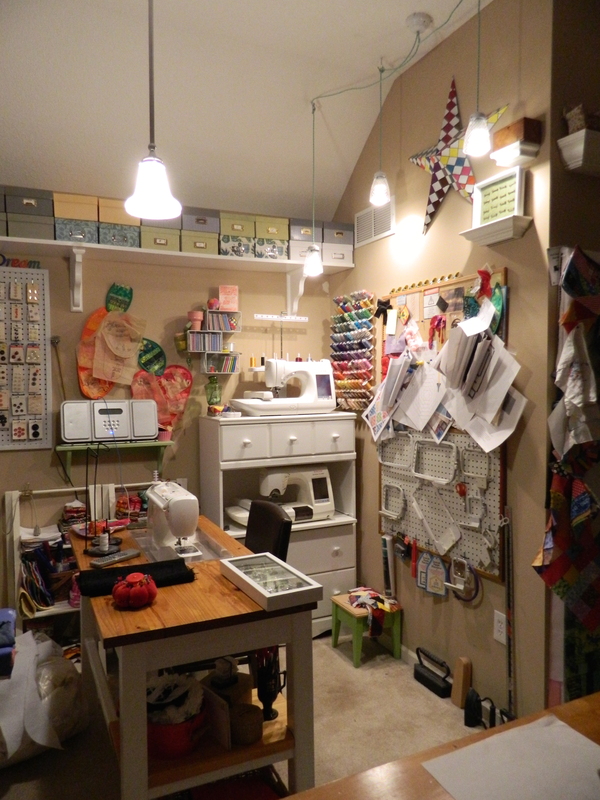 Next The Kid climbed up into the attic and after cutting the power, he wired it to the existing light – the one that hangs over the sewing machine. Here is how we left it after the first night of work. While The Kid was up in the attic handling the wiring, I installed the hooks and worked the wiring to make sure that everything was even. But I goofed pretty good. 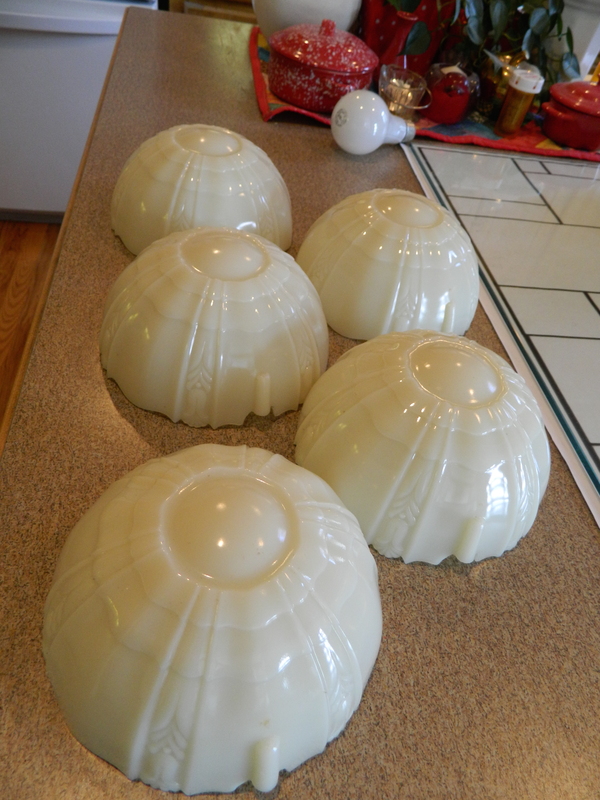 The next morning, we removed the hooks and filled in the holes and then using a tape measure to ensure things were lined up and then rehung the lamps again. With a flip of a switch – viola! – light! Its been a long day. Still much to talk about. And work on. You wouldn’t believe the garage again!